Fill out the form with any questions or inquiries you have for the sales consultants at Lochaven. You can also call or chat with us for immediate responses. The Lyon is a single-level floorplan featuring a spacious layout perfect for empty nesters who like to entertain. Open to the gathering room and dining space that can easily fit a large table to accommodate many guests, the kitchen is equipped with an oversized island. Its many windows make this home design bright and airy, and a luxurious Owner’s Suite is tucked away for privacy. A flex room and basement, along with the option to add a loft, adds even more cozy living spaces. Step inside Lyon to see the Life-Tested Home Designs® with more usable space where you want it most. So you live the way you want to live. Known for seamlessly connecting the kitchen, dining and living spaces, the Lyon features a stunning kitchen with upgraded Moen® fixtures and stainless steel appliances. Its open staircase leading down to the basement offers added detail, and beautiful Emser® tile and optional walk-in shower can be found in the Owner’s Suite. Whirlpool® Stainless Steel appliances - electric double oven range, microwave, dishwasher. 4-1/4” Base Board and 2-3/4” Casing first floor. 3-1/4” Base Board and 2-1/4” Casing second floor. Aristokraft® Sinclair Birch cabinets throughout home; Kitchen 42” with crown standard layout. 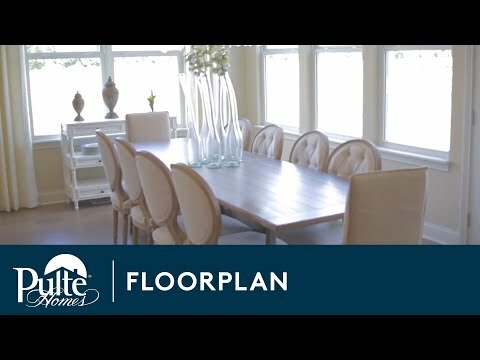 Equipped with Pulte Smart Home Technology.